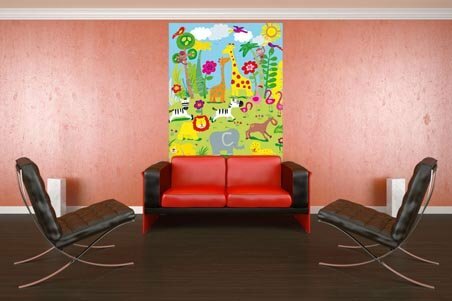 Children's Wall Mural: With its brightly coloured, fun design, this wall mural makes a great addition to any child's bedroom or playroom. Have fun naming all the different Safari animals and picking out your favourite from the giraffe, the elephant, the lion and the crocodile, not to mention all the others! The ideal alternative to boring wallpaper, this mural livens up any room, making it a more exciting and stimulating place to be! 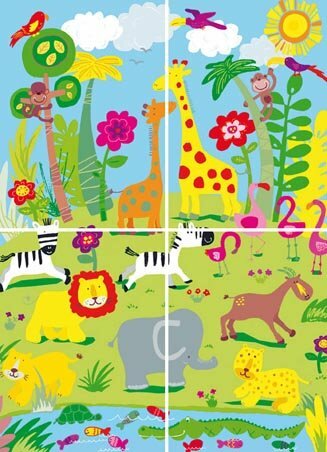 High quality, framed Safari Animals by Jane Hirst, Colourful 4 Sheet Wall Mural wall mural with a bespoke frame by our custom framing service.